Saturday was a real blast. The two main things I was looking forward to have been amazing. Starting with Rebels, it has been confirmed season four will be the last. This family of actors we've had portraying the Ghost crew were up on stage. Tiya Sircar, Steve Blum, Taylor Grey, Vanessa Marshall, and Freddie Prinze Jr. sat with Dave Filoni to look back on the third season and what is coming in the forth. There was some great interaction between the cast, and this is possibly the final time they will all be together. It's a special moment then, and one that certainly was felt among them upon Dave's announcement of it being the last season. We had a brief look at a new character, and Warwick Davis finally has a part in Star Wars animation. Playing the assassin boyguard of Thrawn - Rukh - it seems as though nothing is stopping the reintroduction of past elements into this canon. We'll also be seeing more of Mon Mothma, of Saw Gerrera, and the return of Bo-Katan in what is sure to be one of the greatest Mandalorian arcs across the animated series. And Ezra really seems to be channelling a love of armour, or at least helmets, as we see him in an orange painted Scout-trooper helmet, and even seems to get his own Mando jetpack and helmet. 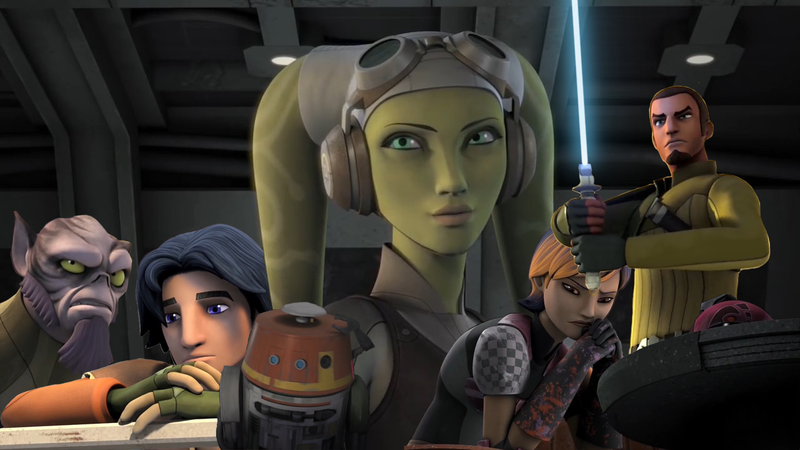 And talking of the trailer, it really sets up the end of the series, with Hera talking about her family. "A boy who was lost, and a girl who was broken ... a survivor, a war veteran, and a fallen knight" really characterises the entire story of these characters, and how far they have come. The end of what she says "But we never imagined it would end like this" is really foreboding. That entire speech is chilling, possibly even more-so than Luke's ending words in The Last Jedi trailer. And that speech is composed of clips from old episodes, then straight into the new stuff. No playing around, and built-up reveals, just clip after clip showing off a lot of new elements. We see Yavin IV. We see Mandalore. Bo-Katan as mentioned, and a curious line from Kanan. "We are the balance, Ezra. We were meant to be Jedi so we could be here, now, when Lothal needs us most." It seems Lothal is going to be featuring again, and whether the whole crew will be along for the ride or just Kanan and Ezra, it should effectively be another loss for the rebels. After all, the meeting of Rogue One isn't so indecisive because of an attack from the Empire. It has to be multiple losses of the rebels. Quite possibly, Lothal will be one of them. Filoni has always talked about getting a wolf into Star Wars, and now he has done it. On what looks to be Lothal. Since this is the final season, and it has been confirmed there are only fifteen episodes, I want this final season to go out with a bang. No singular episodes. Season Five of The Clone Wars had nothing but arcs, and while I don't think we need four-parters across the board, having nothing but arcs for the final season of Rebels will make it a strong ending. From what we see in the trailer, there are at least three major areas. Lothal will be one. Mandalore is another. Hera and her band of X-Wings and my personal favourite part of the trailer form another. That being a hyperspace jump through a length-running hangar of an Imperial installation which devastates everything inside it. Well done for three seasons of awesome, Rebels, and make season four your best. Now, Anthony Daniels was meant to have his panel after Rebels, but there was a lot happening with interviews and such on the Star Wars Show stage, so that didn't get shown. Instead we got a showing of what happened at Smooth Talkin' with Billy Dee Williams. Some good talk happened with a few insights. Of course, nothing against Mr Williams, but I was pretty much just waiting for the start of the Battlefront II premiere. And what a panel that was. The trailer was shown a few minutes in after introductions, and what a trailer that was. Showing off what the story campaign had for us, it also teased the multiplayer. I'd say it was probably a better trailer than the one shown for Battlefront 1 in Anaheim. The story goes that Inferno Squadron is on Endor, and witness to the second Death Star's destruction. Along with the rest of the Empire, Inferno retreat, vowing to avenge the Emperor's death. The story runs from Endor straight up to the fight of Starkiller Base from The Force Awakens. And this story is canon. There is a lot that was talked about this, with the teams involved wanting to tell a story about who are those people in the Empire that young people aspire to be. The pilots, the soldiers. This is all to give the helmeted troopers character through this squad. The leader of the squad is Iden Versio, a female within the elite of the Empire's forces, and she has her father to thank for that. Alongside the campaign and releasing in July is a book by Christie Golden. It's been rebranded to tie-in with Battlefront II, bearing the game's name, but that doesn't change the content. Just makes it stronger, as more can be told about this squad's history, and people can really get a feel for who they are, how they met, and the dynamics they fill within the squad. On the multiplayer side of things, it just get a whole lot better. Classes return, and abilities are the order of the day. 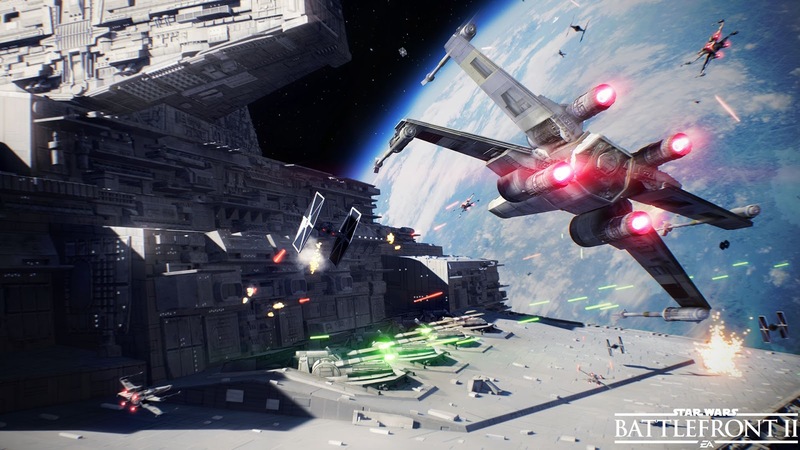 More weapons, more maps, all three eras, and space battles return. Hopefully to form. Classes, heroes, and even ships can be upgraded with abilities, and all of them have different roles to play within the battlefield. The best thing is all three eras. The prequels return. Shown in concept was Kamino, with clones battling with droids. In the trailer we saw Mos Eisley, which could be a hint as to a certain mode returning from the original Battlefront 2. It looked as though Darth Maul and Yoda were on Naboo, which makes me wonder if said mode could be on multiple planets. Now, what was shown and said was all well and good, and a very big start in improving over the first, but it needs more. I've been saying that this could even beat Pandemic's Battlefront II for the vast amount of things within, but I'm pretty sure one major thing will show whether this game can have that title. Everything we see in multiplayer needs to be playable solo and local multiplayer, with the campaign also being playable solo, local, and online. It features a squad of soldiers, it cries out to be played as a team. If that happens, it can have that title, but even if it has the largest amount of content within the game, there are still worries as to gameplay. It certainly looks as though EA have been following advice, and making this game more in-depth with the gameplay, though E3 will have the answer as to whether all that can come together to make the best game possible. Anthony Daniels and Warwick Davis are always a troublesome duo to have on the same stage, and with 40 Years of Threepio, it was no different. The panel was played for the stream after the cosplay contest, and Daniels gives Warwick his own introduction to say after he feels the two Warwick has done don't suit him. After that, Daniels encourages the crowd to do as the Ewoks did and pray for him as he "is some sort of god." The one-upmanship continues between the two as the panel continues, and the hilarity reaches new heights. As Daniels is about to read the comic of how C-3PO got his red arm, and says a hero with a red arm, pictures start on a reel of all the characters Warwick has played with a photoshopped red-coloured arm. Of course, it wasn't all laughs, as we did get a beautiful behind-the-scenes of a part that was cut from Attack of the Clones between Padme and Threepio at the Lars homestead. It showed the inside thoughts of Threepio, in a way. As ever, it was a panel to watch. And while I didn't watch it live, I did take a look at the radio drama that played at the end of the day. Smuggler's Revenge was a brilliant story, with some really great interactions between Han and Leia, as well as Han and other characters. Vanessa Marshall guest starred, as well as Sam Witwer, Steve Blum, and Catherine Taber. Even Warwick Davis got a part. The entire thing was well put together, and after it had all been performed, a bit of behind-the-scenes was talked about. The drama itself had a scene changed on the day it was to be performed. On the Sunday, you could tell the four days were starting to take a strain on some, with Andi on the Star Wars Show stage having a hoarse voice, and the same for Mark Hamill, who still managed to run with his hour-long panel. These Are The Droids You're Looking For had a lovely atmosphere to it, talking about why we love the droids of Star Wars. First up was Matthew Wood, talking about working on the battle droids, and how a misplaced point on the mo-cap suit gave them their characteristic walk. He went into voicing the droids in The Clone Wars, and mentioned why Anthony Daniels - the biggest droid by far - wasn't around. Cue an entertaining phone call between Warwick and Daniels. Once Matt leaves Warwick gets a call on his phone and Anthony appears - behind Warwick - who asks why he wasn't invited. 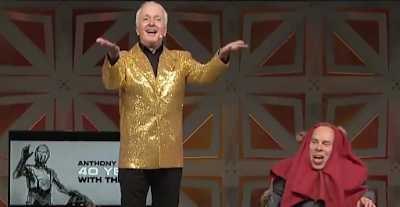 These two are by far the funniest two people to have together on a stage, and after the origins of Threepio were talked about, Anthony leaves. Warwick introduces Alan Tydyk, and halfway through, another call happens, with Anthony walking in from the back entrance complaining about a fake droid being on stage. The two are friendly towards each other in reality, and have a good discussion about the attitudes of the two droids. BB-8 and a load of other astromechs came on stage for the end of the panel. As said, Mark Hamill had a hoarse voice, but that didn't stop him putting on a good story. He's such a good teller of stories, and had some good ones to tell. His dog came on near the end of his panel, and was pretty much upstaging Hamill himself. I'm not going into details as even with a hoarse this is an interesting panel to listen to. The final panel closed off Celebration, with the stages saying what their favourite parts of the event was, and even got the audience involved. On the Star Wars Show stage [which technically is called the StarWars.com stage] Pablo Hidalgo got hold of the T-Shirt gun, and was asked whether this cannon was canon. He said it was, giving a full name, and then fired some shirts into the audience. With each stage also giving their farewells and thank yous, the Celebration stage and Warwick Davis had the final say. Celebrations are usually something special, but this one was quite possibly the most special of all. Perhaps that was because it was the 40th anniversary of Star Wars, and the first panel certainly gave the feeling that this was extra special. Reuniting the cast of the original trilogy and those tributes for Carrie Fisher was heartwarming. Harrison's first Celebration, and how he reacted to seeing the love, was great to see. Hayden Christensen and Ian McDiarmid reunited. And I have no idea what it is about the audience, but they always relish when the actors recite lines from their characters. Forcing it to happen seems to cause a different reaction, though. Anthony Daniels is always welcoming in fitting in 3PO quotes where they fit, though when Ian McDiarmid was questioned by a fan "If I was to say The Senate Will Decide Your Fate, what would you say back to me?" he laughed and knew the fans were waiting for it, but didn't give it. Instead he said in a Palpatine voice "Next Question". However, the guests are some of the best parts, but nothing beats seeing the fans together reacting to news and stories. The Star Wars Show stage is always a good place to see that in action, as the camera pans across the crowd when no action takes place, and whenever fans see themselves on screen they can't help but wave out and cheer. Some go further, such as this year we had dancing Stormtroopers at one point. And when guests are on stage, the cheers, whistles, and applause are always felt. The guests have said across the panel that no fanbase is quite like the Star Wars one, and events such as these show the energy and passion of the fans. Cosplay also plays a big part of that, and the amount of costumes around was staggering to see. Hera, Jyn, Rey, Darth Maul, Mandalorians, Stormtroopers of all kinds, and even the lesser known characters. While you don't get to see much of Celebration away from the stages, the action behind-the-scenes is always fun to see when shown. A re-enactment of that final Vader scene of Rogue One, or lightsaber battles around the place, meetings between members of the public, there's a lot of stuff that happens. As a final word, the news we have seen from Celebration is some of the best we could get. A Captain Phasma novel and comic series, introduction of new characters, planets and vehicles in The Last Jedi, and my favourite piece of information - Battlefront II as a whole, and the canon campaign it will present. More news is bound to follow in the coming months for everything shown, and when the last season of Rebels starts, it will be to a thrilling conclusion I expect. When I get to play Battlefront II, I am expecting it to be the best yet. And importantly - most importantly - when Celebration returns in 2019, I am hoping to go.